UNSW researcher, Adrian Di Qual, will be in attendance at the SUGAR Group's RRRoundup in Feb. and will be presenting some of his research findings. You might remember Adrian and his research team from the research project that they conducted early last year which involved the collection of online surveys from this community. Sugar Gliders (Petaurus breviceps) and other related species in Australia are disappearing due to land clearing and the introduction of foreign animals. The Gliders @ UNSW research team have been studying the biology of these animals as well as methods to conserve them. 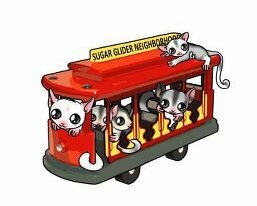 Recently, a survey was done using the experiences of Sugar Glider owners, in the United States and elsewhere, to find out more about their biology and how they are as pets. Results were found relating to: how they bond with people; their reproductive success; the prevalence of health issues; escapism; and the characteristics that make these animals rewarding pets. These will be discussed in terms of implications for pet owners and future conservation implications for Glider species. Adrian Di Qual is currently at UNSW completing a postgraduate research program examining the issues related to the keeping Petaurus breviceps (Sugar Gliders) as pets, supervised by Professor Mike Archer, Dr Suzanne Hand and Dr Paul Hopwood (retired Subdean of Veterinary Science, U. Syd). The SUGAR Group is very excited to welcome Adrian to the RRRoundup and to engage in cooperative research efforts with him and his team as we are able. I won't be there but at least I'll get to meet him next week when he is in Orlando. Are you going to have a proceeds book available to purchase. I am sure there are a lot of people not able to attend the round up that would purchase a proceeds book. The annual Northern Illinois Parrot Society has a proceeds book available and each speaker types up a summary of what they will be speaking on. I love their proceeds book. I for one would be interested in purchasing a proceeds book if you put on out, or even a tape of the speeches. Subject: Re: UNSW researcher to present at the SUGAR Group's RRRoundup in Feb.! !